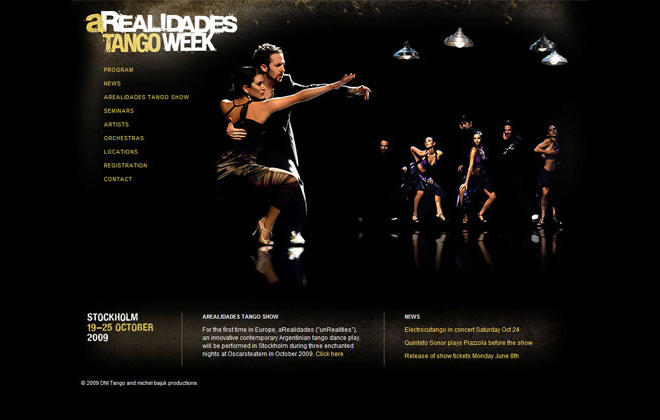 The aRealidades Tango Week is taking place in different locations around Stockholm during the period of 19th-25th October this year (2009). This web page was created to promote and inform visitors and participants about the event as well as assist with ticket sales. The client had strong desires to have tango music playing on the site. A variety of tracks can be listened to on the front page. This was achived by integrating the Dewplayer plugin for WordPress. Another plugin, WordPress Audio Player, is used to play the tracks found under Orchestras. arealidades.com is no longer available since the date for the event has past.